I will be sharing from the scripture Isaiah 54:5, I have read it and heard it many times, but today I saw it in a different way. Though the verse above it speaks on a woman who has lost her husband not being fearful of shame, disgrace and the sorrows of widowhood. ‘Fear not; you will no longer live in shame. I saw it to include myself and all women not just widows, it spoke to me beautifully from a place of intimacy, the woman is assured that she will no longer face what she had been facing whether amongst friends, family, community etc. 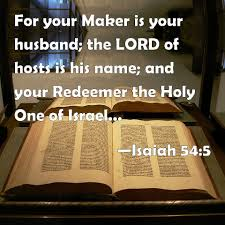 Then goes on to say the creator will be her husband, the one who is the Lord of Heavens Armies, our redeemer and the Holy One Of Israel. How beautiful to know this? I want to focus more on ‘For your creator will be your husband’ for the purpose of this blog post. For a woman to call a man her husband it would have taken a lot of honesty, prayer, transparency, comfortability with the man, her bearing all and him bearing all too. There would have to have been a high level of intimacy especially – she needed to be sure he was the one and that his words matched up to his actions. Because for better or worse, come what may they would be living as one in union with Christ at the centre, so a lot of preparation would have been needed- she would essentially be letting the man lead the household, provide, love her and the children, remain faithful and honest as well as to protect her physically, emotionally and spiritually. When we go on to look at a husband we can see the responsibility he has to carry for the home, to lay down his life and let God equip him to lead her and the children and do the best for them. But essentially he will have Christ at the centre of it all – whether his actions, his mind, his desires, his career, etc. He is fully accountable for all he does and must uphold the vows he made at the altar to his wife. What I love about the verse in question is that it says God will be your husband- for God to be your husband means he will care for you, provide for you, reveal to you, share with you your pain, strengthen you, equip you, comfort you and love you beyond human reasoning and love. He will cover you, but it also takes you doing your own part too, you have to be open, honest , sincere, intimate, transparent and open to correction. Because there then becomes a deeper level of intimacy and love that forms in God being this, with those who have lost someone, preparing to marry and or even divorced. He takes on the burdens and helps you heal and prepare for what is ahead. Different to Him being a friend, He goes deeper and is much more to you. Revelation 3:20 ‘Look I stand at the door and knock’. (He will never force His way in, He gives you the choice). ‘and we will share a meal together as friends..’ (He will come in when you respond and when He does He will eat with you, share with you, speak to you and work with you.) But you need to be willing and open to receiving Him into your heart and not just outside of it. - To love His wife, just as Christ loved the church, he gave up his life for her to make her HOLY and CLEAN- Washed by the cleansing of God’s word. – So beautiful to know that as led by example, the man is to use the word of God as His main tool to love his wife and make her holy and clean. - Just as having God as your husband He will work on you and purge you of ways that will draw you down, teach you what it is to love, heart matters and becoming who He has called you to be. Again you as the woman would have to be willing and teachable. - He did this to present her to himself as a glorious church without a spot or wrinkle or any other blemish- So it’s not enough to speak on it, but his actions must be evident to be able to present his wife without spot or wrinkle, to work deep on areas of hurt, pain and past unresolved issues. A job he can’t afford to take lightly. - Husbands ought to love their wives as they love their own bodies. For a man who loves his wife actually shows love for himself. – The husband can’t be selfish or self-centred, they must be selfless and have a love originating from Christ and in Christ. To love as he loves himself is a deeper kind of love that daily needs to be worked on, but with Christ at the centre he will do the best and be the best definition of love to his wife. - Same way Christ loves us; the husband will learn this and love the woman, despite her flaws, shortcomings and tough days. Because he made that commitment before God, he will as well honour it in all he does for his wife. - Presents his bride to God throughout their lives as perfectly holy and virtuous as can be --To lead his wife and his family into the best things for them. So ladies take it all to God, your heart and your issues and let him comfort you, just as a husband comforts, a father cares, a brother protects. Let God be the all in one that you need, despite the level you are at in life. What does it mean to be transparent? To be transparent is to be open, to share what you have been through and how it has affected you. When you are transparent you are no longer ashamed, you are open and free to discuss what you have passed through to be able to help another who is going through similar. Your transparency will come across to others as someone who is bold, honest and sincere to let others into their world. It means you are not afraid and no longer bound by the things you were going through, in your transparent moments you can receive your healing and grow more spiritually. By this it says that, we are no longer those same people who did those things in the past, so now that we have become born again and know God, are made whole and renewed to be and do better. We no longer define ourselves based on our old selves, but we now define ourselves based on how God sees us. You more or less have the new-found freedom to speak and act with God leading you, you are no longer bound but set free. -People see your struggles and what you have battled with. -There is no time to be selfish, share what God has done and embrace the changes, you are no longer that lost person in the world. To be transparent is to know who God is and have an intimate relationship with Him. When you know who He is and follow Him your assurance and trust in Him develops to be more content in who you are and accept that though you did what you did in the past you are no longer that same person. Do not feel the need to sugar coat all that God has done for you, it takes away the power of the transformation, it is when you lay it all out that you see step by step exactly what He has done and why your faith in Him should not be shaken. When you see this, you are encouraged and know that no matter what is to come you can face it because He will see you through it all. Whatever it may be that you have, or are passing through, God is still faithful now and forever more and will never change, in knowing this when we lay down our lives it will take us to the point of saying it is no longer my will but your will be done- to take up your cross boldly and follow Him. Not to say you wont face things going forward because we know that we cannot escape troubles in our lives especially when we are believers. The devil is forever trying to bring us down, but with God we know that despite all that He will see us through. Be encouraged and know that your story carries weight, a purpose and encouragement for others, you may not understand why when you are in that situation, but when you come out you will see His goodness and forever give thanks.